How Does Buying a Foreclosed House Work? Searching for a foreclosed property is only a few clicks away on the Internet. Generally, homes being sold at Sheriff Sale will be listed in the local sheriff's website. Lenders are required to list properties being sold at auction in local newspapers for as many as three weeks prior to the sale. These are great resources to find the home of your dreams for much less than the retail cost. The price of a foreclosed home, when sold at auction, is usually two-thirds of the appraised value. This value, is often much less than if the home were sold through a Realtor. On the day of the sale, you want to be prepared. Most auction sites require a deposit of 10 percent of the appraised value once the bid is accepted. These can be paid by cashier's check, money order or a bank draft. Cash is not generally accepted, but may be in some areas. Check with your local authorities before the sale. Even though you have bought the property at the sale, you cannot enter the premises yet. Once you have purchased your foreclosed home through the auction, it is important to remember that you cannot enter the premises without the consent of the previous owner. Until the balance is paid and the final court documents are filed, she still owns the home. Many times, since foreclosed homes are bought at auction without the liberty of a walk-through or inspection, new home buyers are surprised at the condition. Homes can be left without much damage or repairs needed, while others will require several months of work. This is a risk that buyers take when buying a foreclosed property. Court records must be filed in a timely manner. 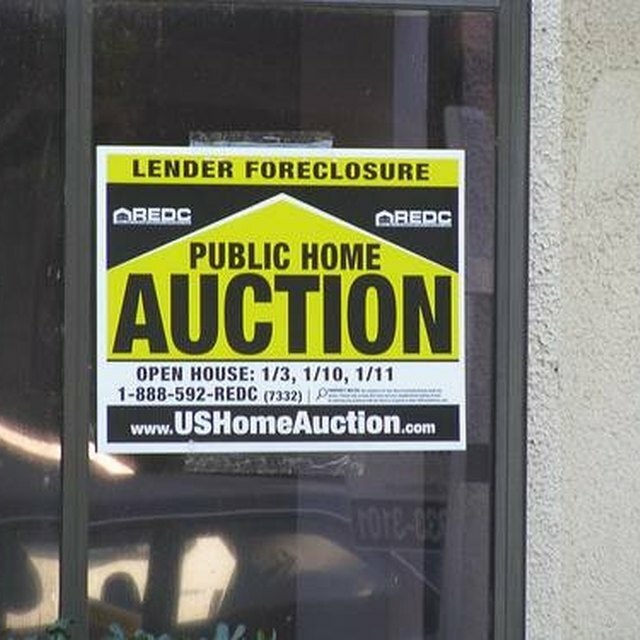 The lender will file a petition once the auction is over. At this time, the court will file a Conformation of Sale. This can take up to 30 days to be filed. At the time of the filing, you have 30 more days to pay the remaining balance owed if not paid in full the day of the sale. After payment is received, the deed will be filed within 14 days. Once the Conformation of Sale is filed, the balance has been paid and the deed filed, you can now visit your new home. While it may be a dream home for you, remember it has been someone else's hardship. The previous owners may still be occupying the home. If this is the case, you can speak with them about vacating. If trouble persists, you must file an eviction notice with the local courts. Once the previous owners have left, your new foreclosed home is yours.